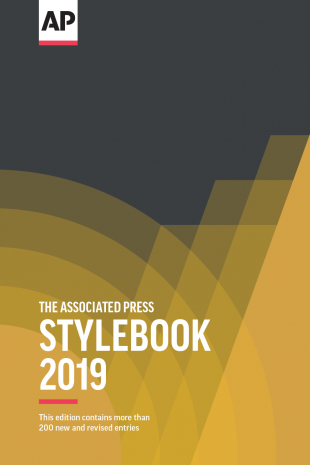 The guidance is immediately available to AP Stylebook Online subscribers and will be included in the new print edition of the Stylebook when it is published on May 29. Guidance not to use “racially charged” or similar terms as euphemisms for “racist” or “racism” when the latter terms are applicable. Guidance not to use the term “black” or “white” in the singular as a noun, and to limit the use of the terms “blacks” and “whites” as plurals. Previewing the new edition at the ACES conference, Stylebook Editor Paula Froke highlighted a few changes, including that the % sign is acceptable when paired with a numeral in most cases, and accent marks can be used with names of people who request them or are widely known to use them, or if quoting directly in a language that uses them. Those changes take effect next week. casualties — Avoid using the word, which is vague and can refer to either injuries or deaths. Instead, be specific about what is meant. If authorities use the term, press for specifics. If specifics aren’t available, say so: Officer Riya Kumar said the crash resulted in casualties, but she did not know whether those were injuries or deaths. data — The word typically takes singular verbs and pronouns when writing for general audiences and in data journalism contexts: The data is sound. In scientific and academic writing, plural verbs and pronouns are preferred. Use databank and database, but data processing (n. and adj.) and data center. cocktail — Do not use cocktail in reference to a mixture of drugs. Instead: drug combination or simply drugs or medications: HIV drugs. 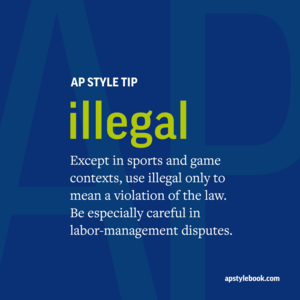 Find AP Stylebook on Twitter, Facebook and online.